Embarking on family travel is more than just throwing all the kid essentials into a bag and hoping for the best. There are certain items that can make your trip far easier when you’re away from home and one of those things is having the best travel pram for your younger kids! We were lucky enough to avoid the travel stroller decision on our first overseas trip with an infant. We travelled to Vietnam and if you’ve been, you probably know there are a lot of places in Vietnam where there really isn’t much point in taking a pram with you. Footpaths are usually parked up with motorbikes and scooters, leaving very little room to maneuver a stroller. And many of the roads, especially around Ho Chi Minh City are cobblestone which aren’t much fun for little people jiggling about in their pram. It can be pretty bad for wear on the wheels too. So we skipped the stroller entirely and just took our Ergo baby carrier, which was perfect for that trip. However sometimes a stroller is the better choice, so you want to make sure you are making the right choice! The right choice we found was the Mountain Buggy Nano stroller! This is by far the best travel pram we have found and it has been all around the world with us! So of course we are going to share why it is the best travel stroller!! 1.1 How Heavy is the Nano Travel Stroller? 1.2 How Does the Nano Mountain Buggy Perform? 1.2.2 Is it Tough Enough? 1.3 Is the Mountain Nano Buggy Easy to Use? 1.4.2 Where Can You Get the Mountain Buggy Nano? The Mountain Buggy Nano is a compact dream! When we first saw it there was no way we imagined it would fold down so small. In fact, you can hardly tell it is even a stroller once it is folded down, as it is that compact! When I was thinking travel prams, I was thinking the long skinny umbrella stroller kind but this was something else completely and so much better! Mountain Buggy Nano folds down so small you can have it as carry on luggage on a plane and fit it easily inside the overhead compartments, without bothering the passengers beside you! It’s actually smaller than a lot of people’s cabin luggage! And the Mountain Buggy travel stroller is light too! Best of all, it comes with an easy to fit cover that protects the stroller and makes it an even more streamlined package when folded down. There is a cut out area of the cover that allows you to use the bottom bar as a handle when carrying the Mountain Buggy Nano. Just like carrying a bag! How Heavy is the Nano Travel Stroller? The Mountain Buggy Nano is a small 6KG. Not the lightest stroller on the market, but it is definitely weighing in at the lighter end of the scale when it comes to strollers and travel pram options. This certainly helps when you may have to juggle a carry on bag, a baby or toddler plus the pram when boarding a plane! The funny thing about the Mountain Buggy Nano is that it wasn’t even just the travel aspect that got us keen. I have a small car. It’s a hatchback without a lot of boot space and when we first went to purchase a stroller for baby number 1, most did not fit my boot! So we were pretty limited on choice. Our original pram took up almost the entire space so there was not a lot of room for groceries and other things. The Mountain Buggy Nano takes up a tiny fraction of my car boot! It takes up less than half the space now because the travel buggy is so compact. Now we fit a full trolley of groceries in there with the Nano loaded in. AMAZING! How Does the Nano Mountain Buggy Perform? Okay so as far as size, weight and the compact design goes, the Mountain Buggy Nano ticks all the boxes for a good travel stroller… but how well does it actually work when put to the test! We had an almost 1 year old and a 3 year old when we first upgraded, in preparation for an extended family trip to Europe. The Nano is suitable for both kids, with a weight limit up to 20kg. This is fantastic compared to many lightweight strollers that have a wait of 12 – 15kgs. This suited both of our kids and actually still does even with a 5.5 year old who sometimes doesn’t want to walk anymore! Yeah… life with kids, right! 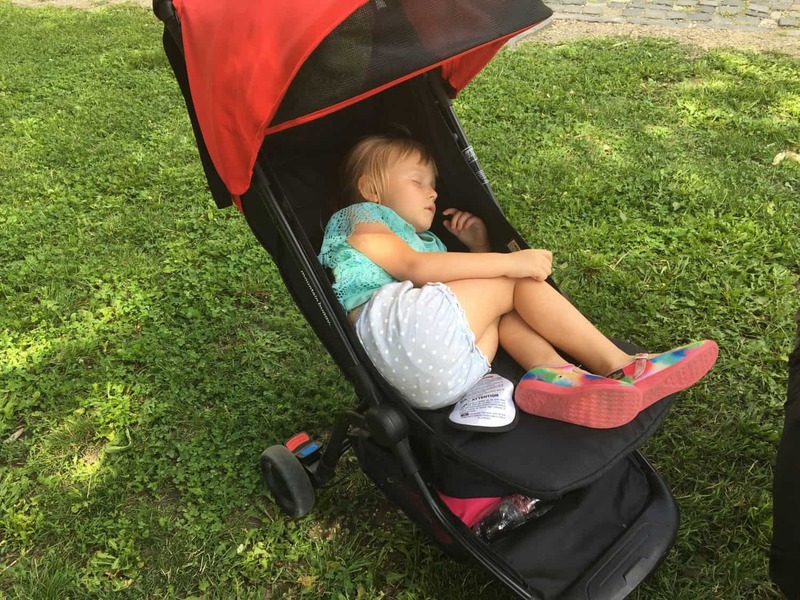 And as you can see, even at 3, there was plenty of room for our eldest for naps in the park in Budapest! She is tall for her age too. It reclines maybe 2/3 of the way down, so not completely flat, but this is fine for older babies and young kids like our two. They have both managed to nap quite solidly in their stroller on many occasion. The Mountain Buggy Nano is recommended for 6 months and up, so once the kids have a little more neck control and don’t need that flat lay option, however you can absolutely use it for a newborn too as they have some pretty cool add ons available! Mountain Buggy offer both a newborn cocoon or a compatible Mountain Buggy Nano car seat that fits into the Nano stroller to allow use from birth. This means the pram is a perfect investment right from birth! Especially if you’re planning a bit of jetsetting with your youngster! We found our Nano to be really sturdy. It is fairly smooth riding and the wheels appear strong, even on rough surfaces. It didn’t feel like it was going to crack over time and our wheels still haven’t had a lot of wear considering we have been using it for several years now. And I will be honest… sometimes our kids like to double up on it haha Not an ideal situation, but when two people have tired legs and mummy doesn’t want to carry anyone, our youngest sits on our eldests lap. That’s about 27kg worth of child. Eeekkkk. It’s pretty annoying trying to steer them both though! Rascals! The canopy gives a fairly good coverage from sun. And it is easy to push or pull into position. The leg rest can fold down too, which is how our eldest prefers it. Or can remain flat for shorter legs. You just have to lift slightly for it to unlock position. Simple! There is a huge basket space underneath which fits a lot. I love this as our old pram had almost no space at all. I can easily fit a large handbag or all our jackets underneath it. Perfect for days out at a theme park or similar because you can put water bottles and snacks in there and don’t need a big bag to carry. We love our theme park visits! And this pram has been to many, including Disneyland! The only negative would be the fact the handle is not adjustable, although this is not an issue for me as I’m pretty average height. Simon on the other hand is 6 foot so he finds it a little lower than he would like but not enough to cause discomfort. But really, that’s one small thing compared to so many great features! Is the Mountain Nano Buggy Easy to Use? I still remember my first solo catch up with the girls for lunch with a newborn and our old pram, then loading the car in the heavy rain and not being able to work out how to fold it down. I was drenched and thankfully my mummy friend came to the rescue after some muck around. Oh boy! I was in a panic. I thought I was going to have to call hubby to come fold it down! None of that has ever happened with the Mountain Buggy Nano. It’s so easy even I can do it! Best of all it’s light enough to pretty much flip back out again too. It takes very little effort for either position, and it is simple to slide the Mountain Buggy Nano travel bag over the top too. We only really use the carry bag when we are travelling, as it would be a bit of extra fuss for everyday use, but we love the fact that it stays protected when in transit and easy to tag if you did decide to have it as checked baggage instead of carry on. Our verdict – we love our Mountain Buggy Nano. It really is a dream to use and definitely the best travel pram we have come across in our search. It has given us easy travel across Europe, the Dominican Republic, and the USA, plus of course many local adventures around Australia. We don’t have to worry about overweight luggage or oversize. Nor do we have to stress about it getting lost as checked baggage since we can use it right up to the boarding gates, fold it down, put on the cover and carry it on board to the overhead locker! The Nano is durable and easy to fold up and down. It has suited both our kids from age one right up to our almost 6 year old now and we definitely recommend it to anyone we know looking for a compact travel pram. The BEST travel pram !! Pretty much if you are looking for a sturdy, easy to use compact travel stroller, the Mountain Buggy Nano has got you covered! Where Can You Get the Mountain Buggy Nano? This is the best travel stroller Australia had on offer when we started looking and we were able to pick ours up at a local stroller speciality store, however you can also purchase the stroller online for convenience and have it shipped to your door. They are available in different colours too, so you can get one that suits your personality! You can also get the Mountain Bubby Nano with car seat insert too, and other accessories for your convenience. A good product. Needed one for whom have little kids. Glad to read this review. Keep sharing such useful post. Thanks. I actually just bought a car seat for my infant! My daughter was just born and it was really difficult to choose. Thanks for this wonderful post. Hey, this stroller is beyond fantastic for airline travel with a small infant. I purchased the mountain buggy nano 5 months ago and absolutely love it. Recently, I just returned from a trip to temples of Angkor Wat, Cambodia with my 3 yr old and 6 yr old, and having our Nano along made the trip so much easier. Thanks for sharing the valuable information with us and I really loved your post. Keep up the good work. Just wow, Thanks for sharing. It looks like it is easy carrying pram.